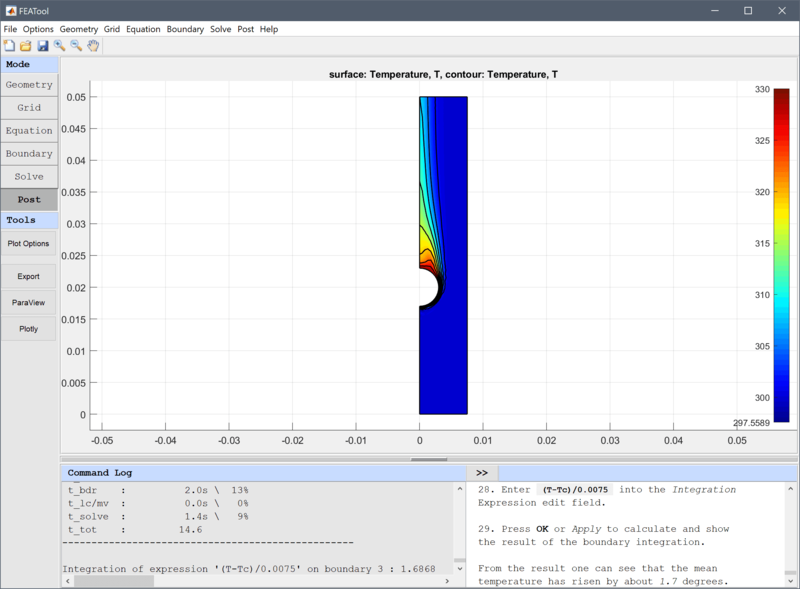 This example illustrates the multiphysics capabilities of FEATool with a simple heat exchanger model featuring both free and forced convection. The model consists of a series of heated pipes around which there is a lower temperature fluid flowing. Two kinds of physics are considered, fluid flow which is modeled by the Navier-Stokes equations and heat transport modeled by a convection and conduction equation for the temperature field. The Boussinesq approximation models the temperature effects on the fluid, and the flow field is coupled to and transports the temperature field. In this way the system is fully two way coupled, the fluid to the temperature and temperature to the fluid. How to set up and solve the heat exchanger example with the FEATool graphical user interface (GUI) is described in the following. Alternatively, this tutorial example can also be automatically run by selecting it from the File > Model Examples and Tutorials > Quickstart menu. 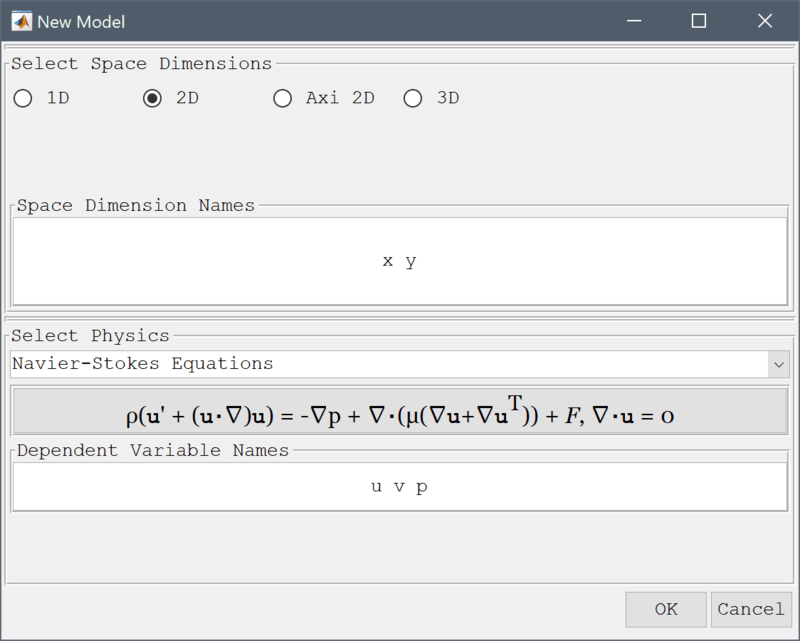 In the New Model dialog box, select 2D for the Space Dimensions, and select Navier-Stokes Equations from the Select Physics drop-down menu. Leave the space dimension and dependent variable names to their defaults and press OK to finish the physics mode selection. The geometry of the heat exchanger cross section can be created by first making a square and a circle, and then subtracting the circle from the square. The geometry object properties must now be edited to set the correct size and position of the rectangle. To do this, click on the rectangle R1 to select it which highlights it in red. 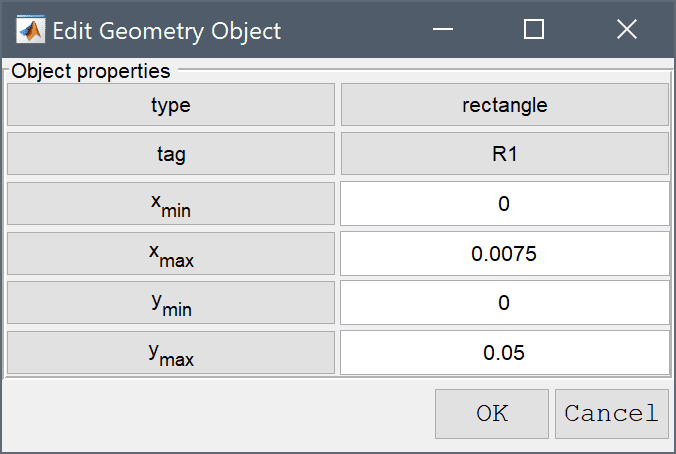 Then click on the Inspect/edit selected geometry object Toolbar button, and change the min and max coordinates of the rectangle so they span between 0 and 0.0075 in the x-direction, and 0 and 0.05 in the y-direction. 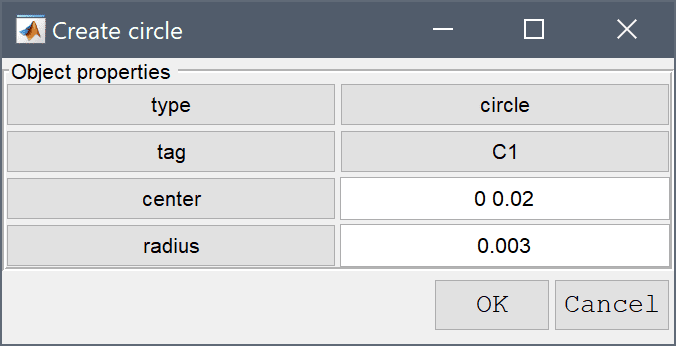 Create an ellipse/circle and set its radius and center to 0.003 and (0, 0.02) respectively. Enter 0.003 into the radius edit field and press OK to finish and close the dialog box. To subtract the circle from the rectangle first select both geometry objects by clicking on them so both are highlighted in red, and then click on the - / Subtract geometry objects button. (Alternatively, if the circle is obscured by the rectangle they can be selected by holding the Ctrl key while clicking on the labels R1 and C1 in the Selection list box, or in this case simply pressing Ctrl + a to select all objects). Enter 0.0005 into the Grid Size edit field, and press the Generate button to call the automatic grid generation algorithm. Equation and material coefficients are specified in Equation/Subdomain mode. In the Equation Settings dialog box enter the following coefficients, rho for the density, ρ, mu for the viscosity, µ, and alpha*g*rho*(T-Tc) for the volume force in the y-direction, Fy. A heat transfer physics must also be added. 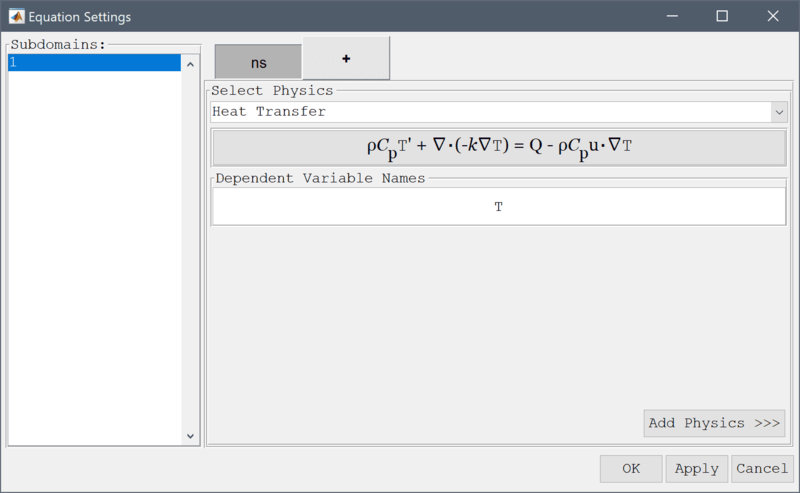 To access the multiphysics selection and add another physics mode press the plus + tab and select Heat Transfer from the Select Physics drop-down menu. Add the selection by pressing the Add Physics >>> button. Note that each physics mode will have its own tab for Subdomain and Equation settings, and Boundary conditions. Moreover, FEATool works with any unit system, and it is up to the user to use consistent units for geometry dimensions, material, equation, and boundary coefficients. In the ht Equation Settings tab, set the density to rho, heat capacity to cp, and thermal conductivity to k, respectively. 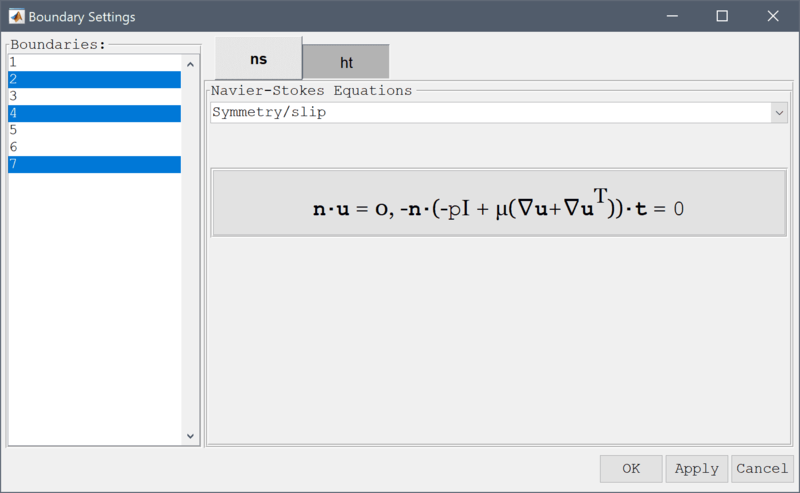 The convective velocities should be coupled from the Navier-Stokes equations physics mode, to do this enter u and v in the corresponding edit fields (as these are the default names of the dependent variables for the velocities). Press OK to finish with the equation coefficient specifications. 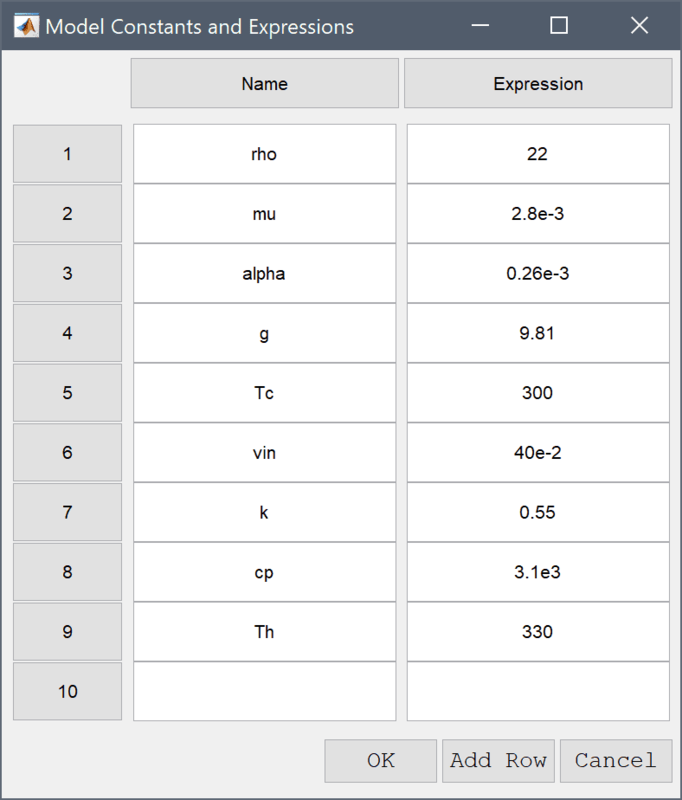 The Model Constants and Expressions functionality can be used to define and store convenient expressions which then are available in the point, equation, boundary coefficients, and as postprocessing expressions. Here it is used to define the load force. 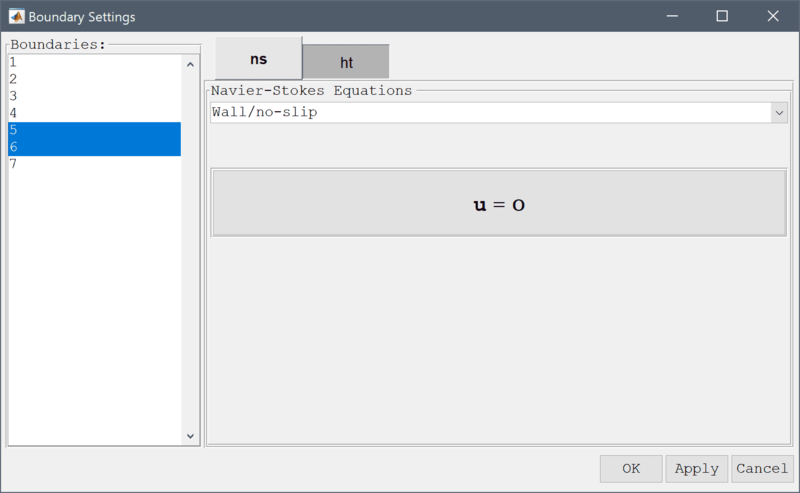 Press the Constants Toolbar button, or select the corresponding entry from the Equation menu, and enter the following variables in the Model Constants and Expressions dialog box. Press Enter after the last expression or use the Add Row button to expand the expression list. 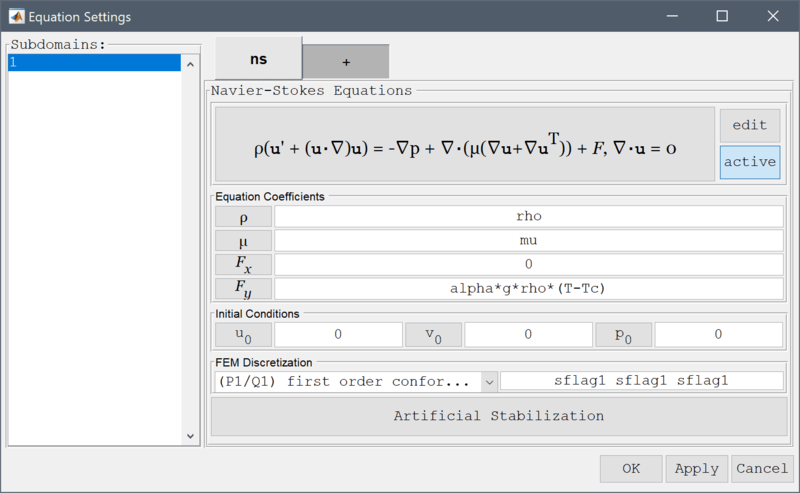 First select the ns tab, which allows for specifying boundary conditions for the Navier-Stokes equations physics mode. Then select all vertical boundaries (here 2, 4, and 7), and choose Symmetry/slip from the drop down box. 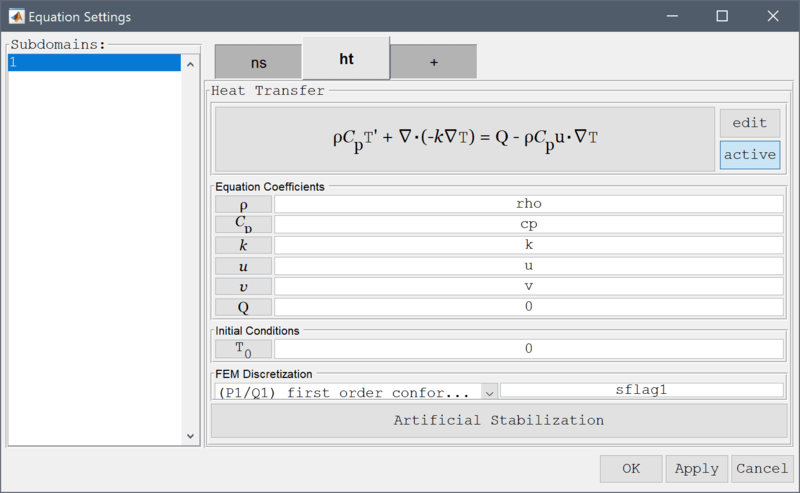 Switch to the heat transfer physics mode by selecting the ht tab and choose the Thermal insulation/symmetry boundary condition. The selected boundaries will be highlighted in red. Continue with the top boundary (number 3) which is the outflow. Select Outflow/pressure for the Navier-Stokes physics mode and Convective flux/outflow for the heat transfer mode. Lastly, the boundaries on the cylinder (5 and 6) are walls and should be prescribed with Wall/no-slip boundary conditions for the velocity. For the Temperature the constant high temperature Th should be prescribed. From the resulting flow field one can see that fluid is accelerated when it passes between the cylinders. 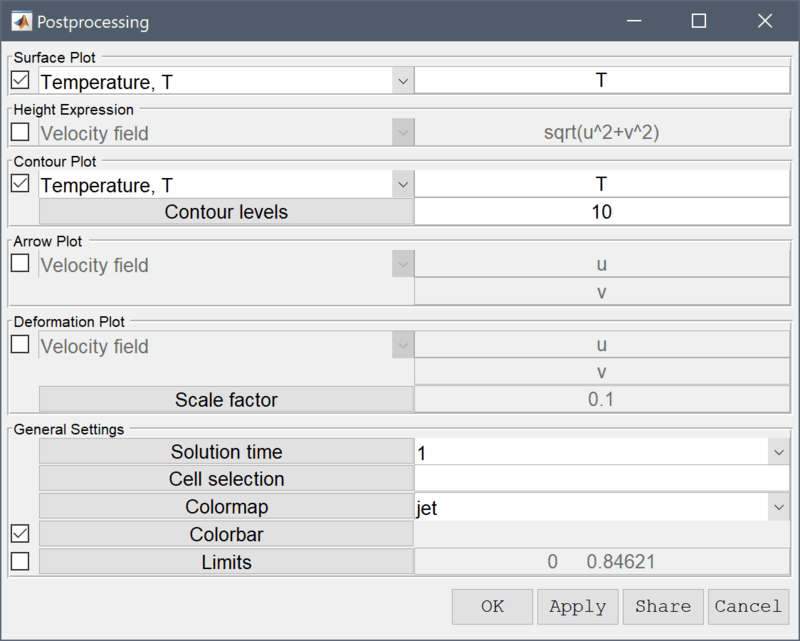 To visualize the temperature field, open the Plot Options and postprocessing settings dialog box and select to plot and visualize the Temperature, T as both surface and contour plots. The temperature plot show that the fluid is heated around the hot cylinder and follows the flow upwards. 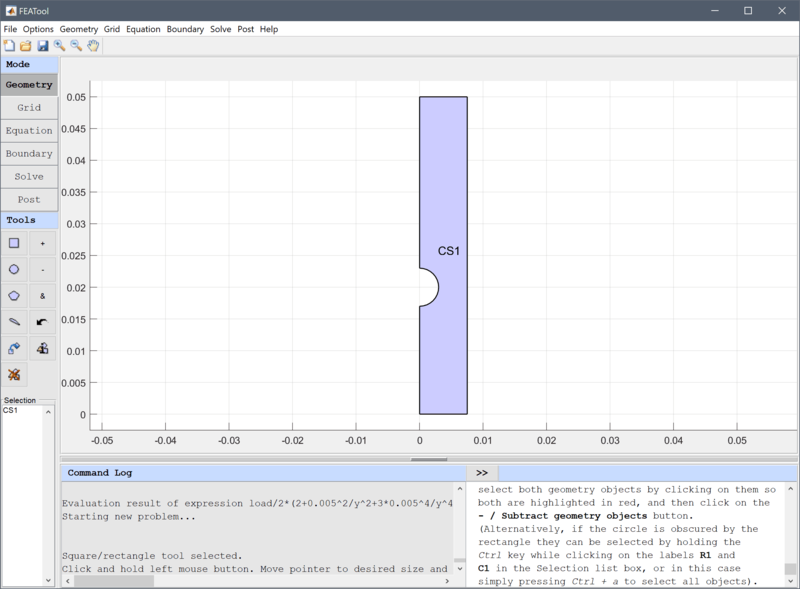 FEATool also allows for advanced postprocessing such as boundary integration. Integrate the expression (T-Tc)/w over the outflow boundary (where w = 0.0075 is the width of the domain) to find the change in the mean temperature. 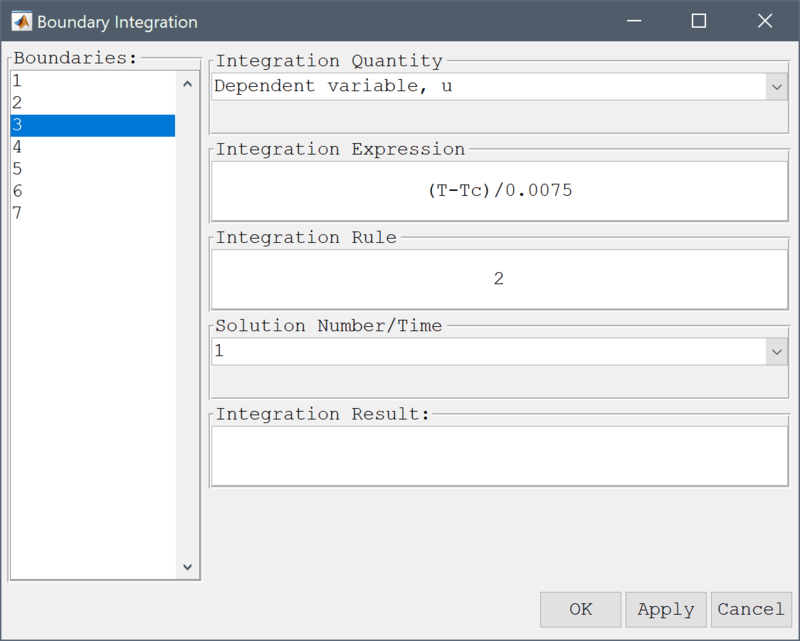 Enter (T-Tc)/0.0075 into the Integration Expression edit field. Press OK or Apply to calculate and show the result of the boundary integration. From the result one can see that the mean temperature has risen by about 1.7 degrees. 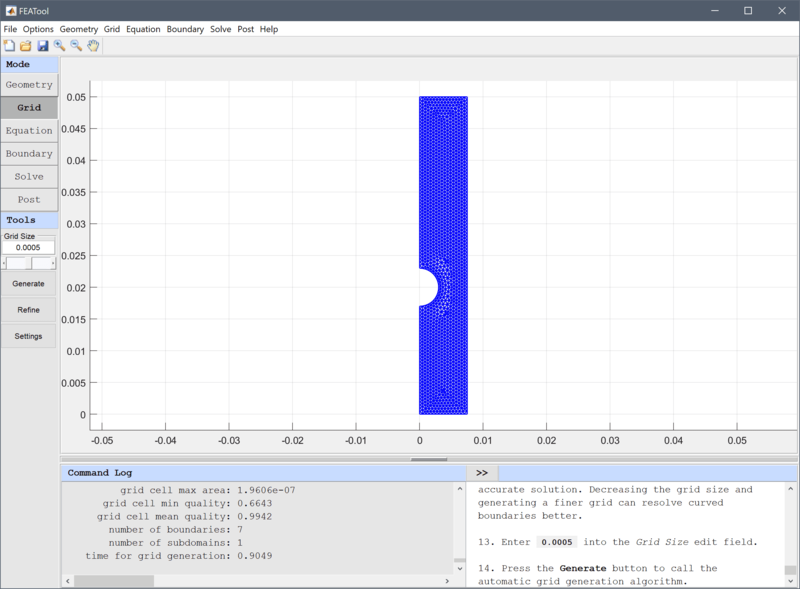 The heat exchanger multiphysics model has now been completed and can be saved as a binary (.fea) model file, or exported as a programmable MATLAB m-script text file, or GUI script (.fes) file.